“The party is calling! 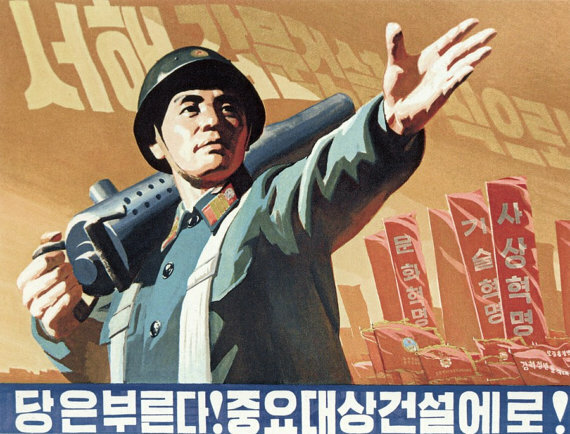 There’s important work to be done!” While the red banners call for revolutions in culture, science, and ideology, the main message is about helping with a West Sea (Yellow Sea) land reclamation project. Few words adorn the painting aside from “Made from our own hands,” above the images of a missile, tank, and patrol boat. 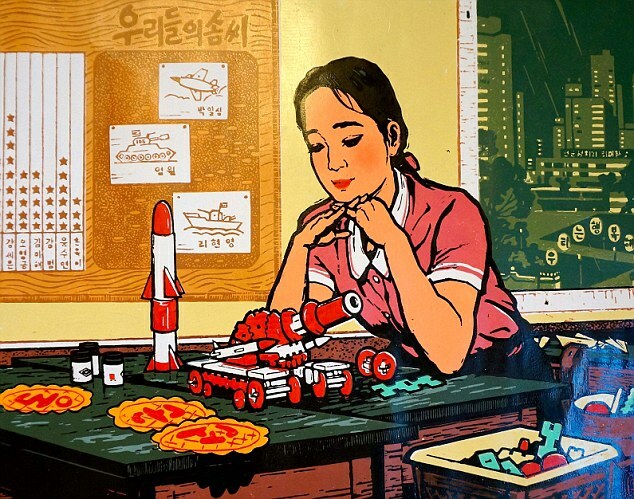 Apt imagery for the regime’s emphasis on economic and technological self-reliance over reliance on outsiders. Also note the stars over the names of students to the left – some things are the same in classrooms everywhere. 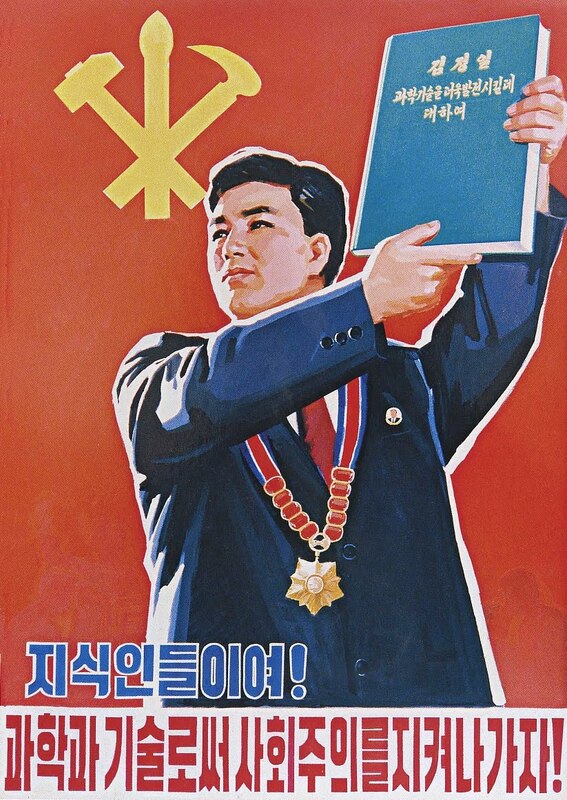 Reminding once again of North Korean socialism’s unique emphasis on knowledge workers (teachers, artists, writers, etc.) in addition to the more typical focus on workers and farmers/peasants. Also note North Korea’s addition of the calligraphy brush of the intellectual to the traditional hammer and sickle communist emblem. 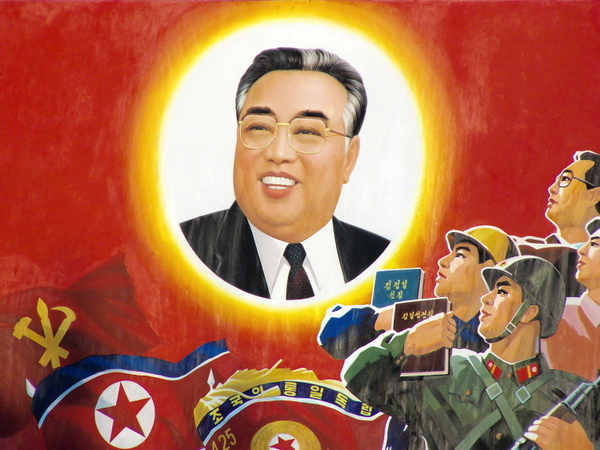 This entry was posted	on Wednesday, July 8th, 2015 at 8:10 pm	and is filed under North Korea. You can follow any responses to this entry through the RSS 2.0 feed. You can leave a response, or trackback from your own site.